Castle of Ardeshir’e Babakan, also known as the Atash-kadeh, is a castle located on the slopes of the mountain on which Ghaleh Dokhtar is situated on. 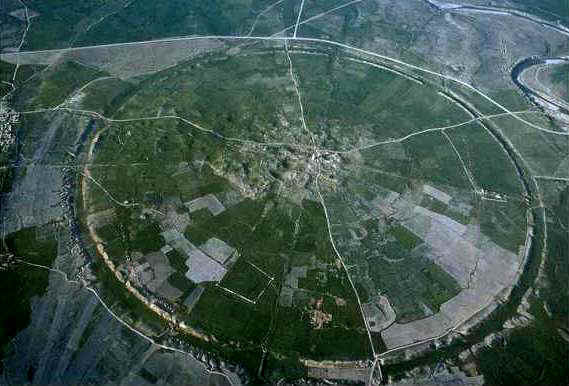 Built in AD 224 by Ardashir I of the Sassanian Empire, it is located two kilometres (1.2 miles) north of the ancient city of Gor, i.e. 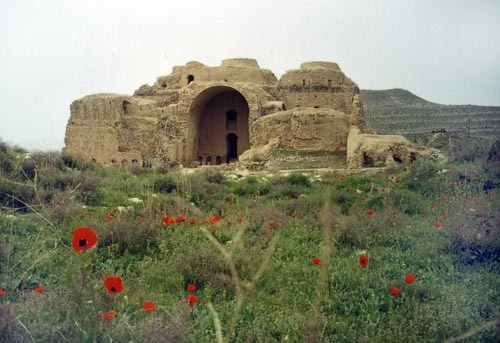 the old city of Firouzabad in Fars. 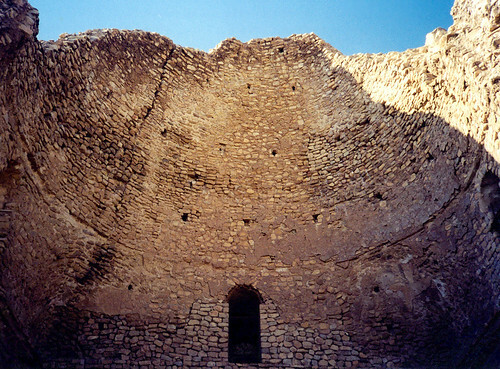 The structure contains three domes, among other features, making it a bit larger and more magnificent than its predecessor the nearby castle of Ghaleh Dokhtar. However, it seems that the compound was designed to display the royalty image of Ardashir I, rather than being a fortified structure for defense purposes. That is why perhaps it would be best to refer to the structure as a "palace" rather than a "castle", even though it has huge walls on the perimeters (twice as thick as Ghaleh Dokhtar), and is a contained structure. From the architectural design, it seems the palace was more of a place of social gathering where guests would be introduced to the imperial throne. What is particularly interesting about this palace is that its architectural design does not exactly fall into that of the Parthians or even Sassanian category; the design is a unique design particular to architects of Fars. The palace was built next to a picturesque pond (on the bank of the western branch of Tangab River) that was fed by a natural spring, perhaps in connection with the Persian goddess of water and growth, Anahita. . The spring is thought to have fed a royal garden, in the same way that Cyrus had his garden built at Pasargadae. The pond was tiled on its sides, surrounded by pavement for guests of the royal court to enjoy the evenings by. The structure is 104m by 55m. The balcony is 18m high, although it has partially collapsed. The walls were built of rubble with quick-setting mortar and were as much as 4 metres wide. The outer walls seem to have been slightly articulated by two rows of vertical niches. This articulation, however, would not have detracted from the massive defensible appearance of the structure, to which the low heavy cupolas must have contributed. Originally the rubble walls were covered with stucco, which is still preserved in some places in the domed halls and in the court of the palace. Niches, with a semi-circular top, were set in rectangular frames and moulded in the stucco. The lintel of these niches was formed by a cavetto cornice of the type used on the lintels of windows and doors in the palaces of Persepolis from which those of Firuzabad were surely copied in a conscious imitation of Achaemenid architectural features. The balcony, as in the Parthian palace of Ashur, was designed with the ancient Near Eastern type of house in which the rooms open on an inner court to produce a complex which was well suited to the climate of these regions. The style of the interior design is comparable to that of Tachar palace at Persepolis. Direct parallels have been discovered between the Castle of Ardeshir and the Basilica of Maxentius in Rome.